The people who publish Age of Empires and Halo Wars have a secret real-time strategy title in the works for Games For Windows Live, which Microsoft Games Studios is calling "Project S." Other people are alpha testing it now. Microsoft is seeking more alpha testers for what it describes as a "groundbreaking," "giant, revolutionary step for PC strategy games." Some of those alpha testers have forwarded details on the project Microsoft is referring to as "Project S" and "Spartan," a clue that this may be a title set in the Halo universe. Among the questions being asked of potential alpha testers for Project S is whether they've played other PC strategy games, including StarCraft, Warcraft III, Age of Empires and Farmville. The Project S alpha has been underway for the past few weeks, according to Microsoft's survey, and is planned to run for a month or two. Project S could be something as simple as a Windows version of Ensemble Studios' Halo-themed RTS Halo Wars or a sequel to that game. 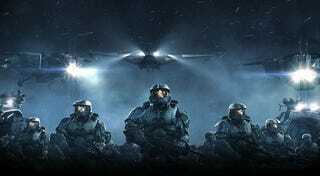 Or it could be something unrelated to Halo's fiction, featuring actual Greek spartans. Do you know? Update: Project S appears to be something other than a Halo game, taking its codename from the original Greek spartans.